Best free collection of save animals and wildlife conservation slogans with a meaningful message. Including picture quotes & sayings. Wildlife refers animals that are not normally domesticated. Wildlife plays a vital role to provide stability to different natural processes of nature and in balancing the environment. Here are a few facts about endangered wildlife. A species is declared extinct after many years of not being spotted. Extinction is a natural phenomenon, it occurs at a natural "background" rate of about one to five species per year. As many as 30 to 50 percent of all species are possibly heading toward extinction by mid-century. Saving animals is super easy and it doesn't matter how old you are. One simple is method is by simply buying cruelty-free products. Animals shouldn't be blinded, poisoned, or burned just for the soap, shampoo, or lip balm we use. But in labs across the country, these things happen all the time. Take a stand against animal testing by buying only cruelty-free products. Its easy! Just take a look at the package, and make sure that it says that it wasn't tested on animals. Also don't support animals in entertainment. Animals are alive for their own reasons, not to entertain us. Animals in movies, circuses, and zoos are denied everything that is natural and important to them. They will never be allowed to hang out with their families, graze, or do anything that they would do in the wild. Refuse to support this cruelty by never going to a zoo, marine park, or circus that uses animals. 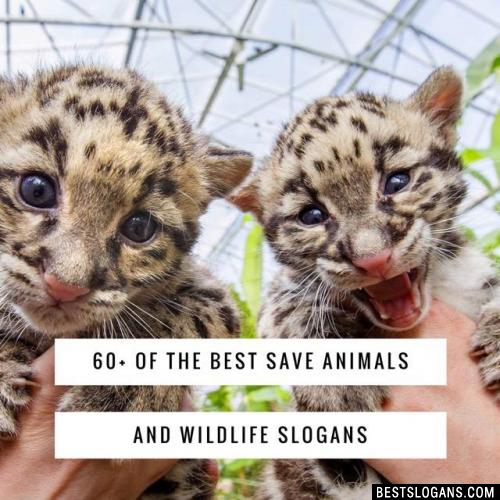 While you decide on whatever method it is you wish to start helping to save animals, checkout our amazing collection of save animals and wildlife conservation slogans. 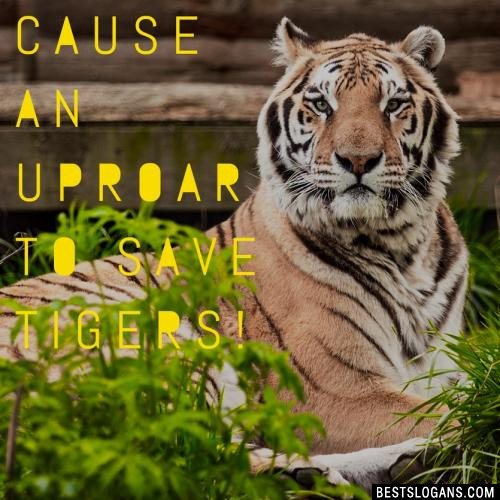 Cause an upROAR to save tigers! 3 Shoot me with camera, don't shoot me with gun. 4 Some species are slipping away, can't we help them in some way? 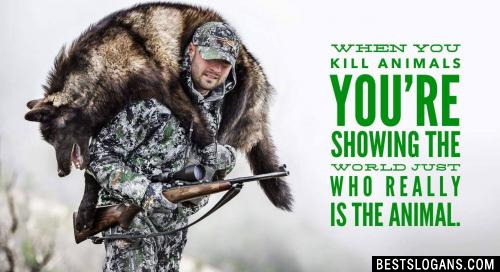 When you kill animals you're showing the world just who really is the animal. 6 Save wildlife and wildlife will save you. 7 No wildlife. No human life. 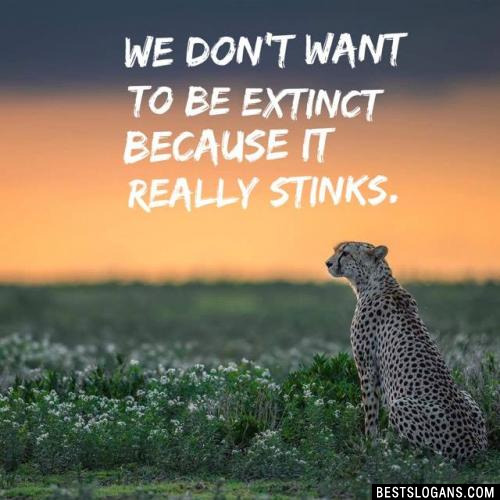 We don't want to be extinct because it really stinks. 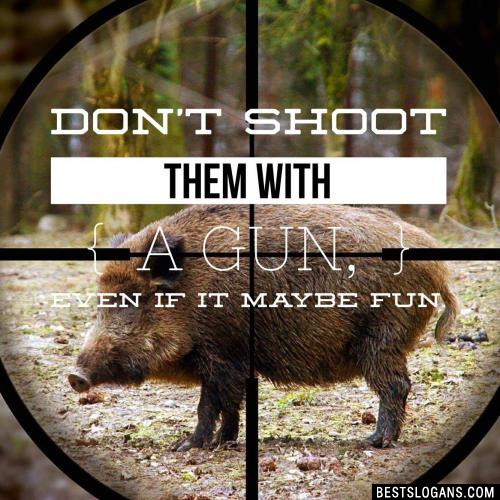 Don't shoot them with a gun, even if it maybe fun. 10 Fur belongs to the animal that was wearing it first. 11 Fake for the animals sake. 12 Animals are my friends and I don't wear my friends. If you are what you eat, does that make you dead meat? 14 Cruelty is one fashion statement we can do without. 15 The fascination of shooting as a sport depends on which end of the gun you're on. 16 Humans aren't the only species on Earth. We just act like it. 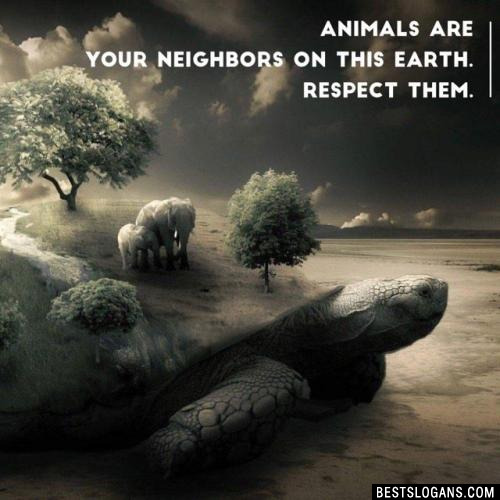 Animals are your neighbors on this earth. Respect them. 18 Hunting is not a sport. In a sport, both sides should know they're in the game. 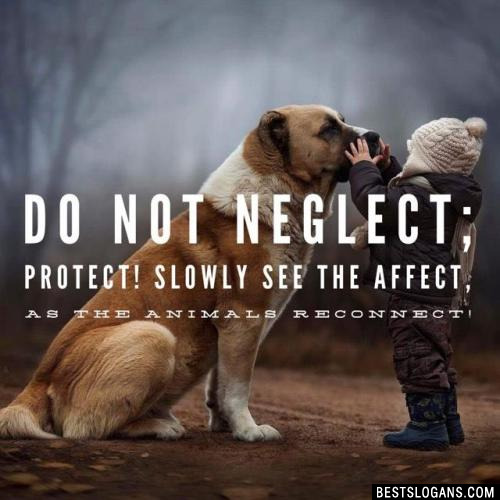 Do not neglect; protect! Slowly see the affect, as the animals reconnect! Can you think of a good Save Animals And Wildlife Conservation Slogans we're missing? Or come up with a clever one of your own. Please share below.